We are planning our third trip to the Thai islands, very excited!! Some friends keep asking us why? Why we go to the same places every year? 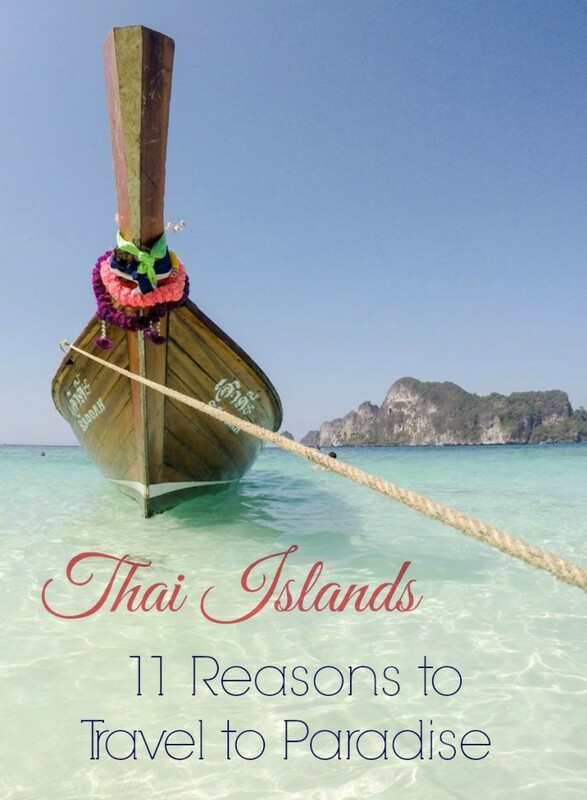 The answer is simple: we love the Thai Islands! Every trip there we discover new beaches, hidden places and have incredible moments. If you have already visited some of the Thai islands, I’m sure you know what I’m talking about. If you have never been there, don’t worry, you still can travel to paradise. So prepare your credit card, because after reading this post you will need it to book your trip to Thailand. We could write an endless list of all the amazing things you can do and experience at the islands, but let’s keep it simple, 11 reasons are more than enough to sparkle your wanderlust! The hills are steep and covered with tropical forest. Even in more developed islands like Phuket or Koh Samui, you still can see beautiful mountains coated with all shades of green. The fruit trees and colored flowers surrounded by the blue sky and transparent sea create an amazing scenery. Perfect for an Instagram photo, and also a life-saving spot when you need a shade to sit, relax and enjoy the landscape. Huge rocks, different shapes and millions of years. The rocky islets just appear in the middle of the sea, like God have decided to sprinkle some grey & green giants to protect the coast. The Andaman sea is the place to find these enormous rocks that seem to be floating on the salty water. You can stay hours looking at them, identifying different animals and even faces. A paradise for wildlife and rock climbers, they are a challenge for the fisherman and boat captains. At nighttime, they have to avoid these hard giants, and during the day, they sail very closely, so the tourists can have a glimpse of the incredible formations. Ohhh, the sunsets! Golden sky and fresh breeze that will make you stop whatever you are doing to contemplate the spectacle. Seriously, the sunsets at the Thai islands are unbelievably beautiful. They will ruin your life, you will never forget that the smell of the sea and the orange sky. Listen to me, around 5:30 pm – 6.30 pm go to a beach bar and grab a beer, Leo is the best selling beer in Thailand, and our favorite! Seat and relax! Recharge your batteries, celebrate one more amazing day at the Thai island, and welcome a happy new night. That’s how we do it! In all Thai islands you can find a sunset beach, a sunset point or a sunset boat trip. Thai people take their “sunset moment” very serious, and I’m not surprised, they know how to appreciate nature. Swim! Take a deep breath and open your eyes underwater. If you think the Thai islands are stunning, wait until you dive in the sea. 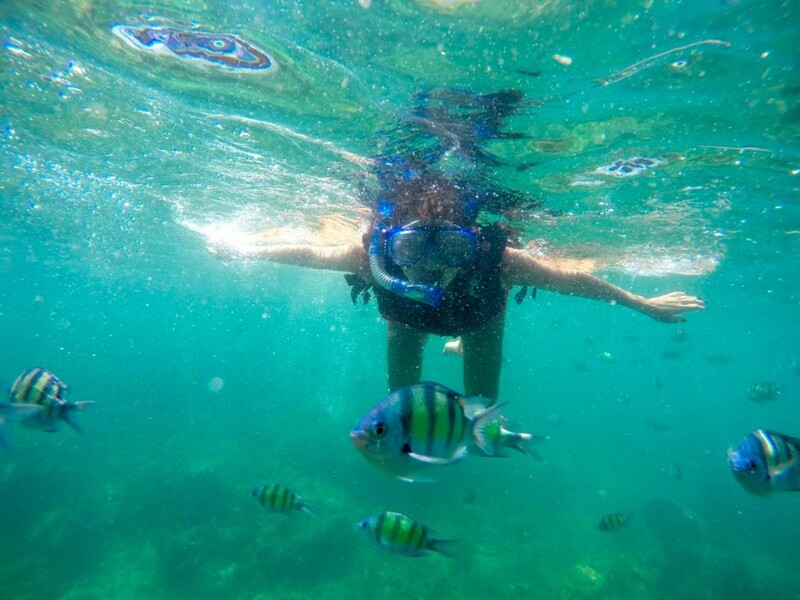 You don’t need to go too far or too deep, in Koh Tao or Maya Bay the striped friendly fishes will swim around your knees. For us, travel to the Thai islands means to explore the place by land and specially by water. 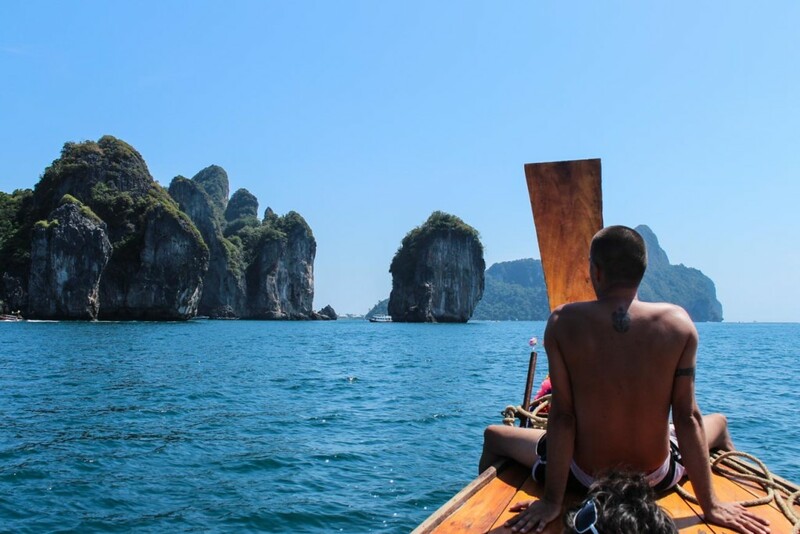 Go for a boat trip around the 4 Islands, a few minutes from Krabi, I’m sure you will love it! 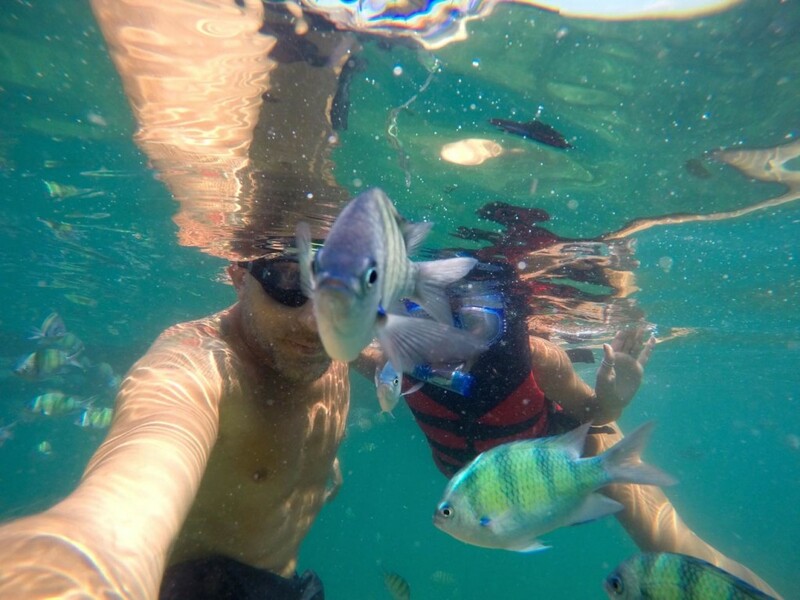 The boat tour in Koh Tao is a must too, spend all you energy swimming close to the corals at Mango Bay. If you are big fan of diving, Koh Lipe is famous for its crystal clear water and great spots for dive. After spending the whole day in the sea or by the beach, you will be tired and hungry. Don’t worry, at the Thai islands the fish is always fresh and the spices will give you a kick to start the night. Feed your stomach and soul with different flavours, fresh seasonings and fruit juice. If it smells good, it will taste good! In all the Thai islands you can find a local night market to taste fresh Thai food, and don´t forget to order a Leo, the best selling beer in Thailand. 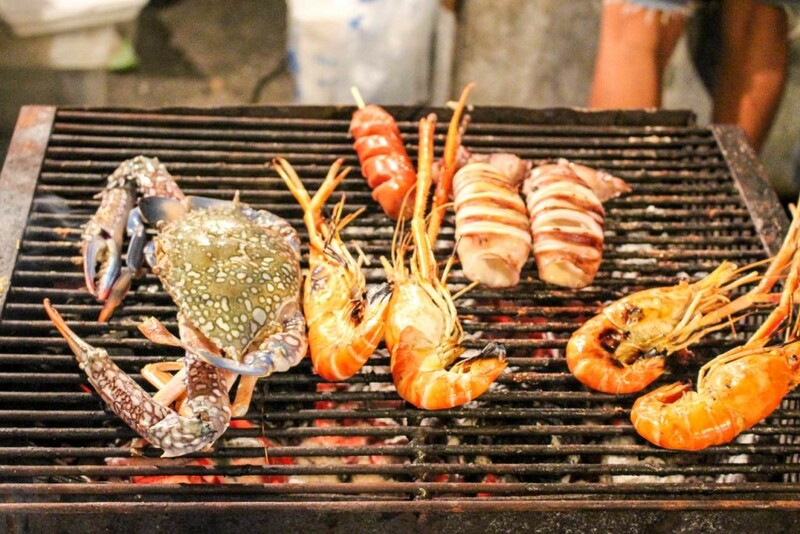 Phuket and Koh Phangan are street food paradise, we love them! Can we have a BBQ prawns now?? Yummy! Wish all the roads in the world have views like this! Travel to the Thai islands and rent a scooter. At every corner you will find a stunning beach, a little bay or rocky cliff inviting you to stop, take a picture and maybe stay forever. 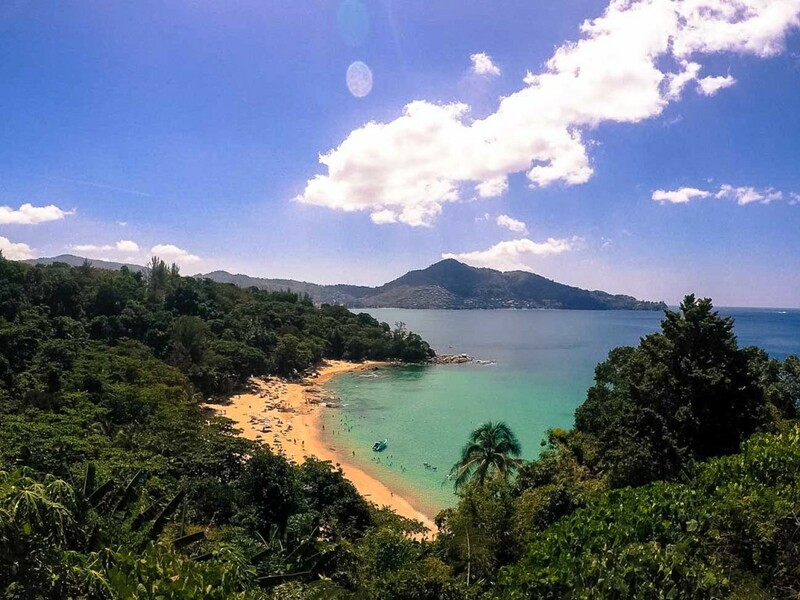 Phuket, Koh Tao and Koh Phangan are our favorite islands to drive around, so many secret places and hidden spots that you never dreamed it could exist. You are on holidays and everything looks perfect, but you still need to wear helmet and drive safe. Don’t forget: travel insurance is a must, you are in paradise, but better stay on the safe side otherwise you will end up in heaven. I know, you are travelling to the Thai Islands, for sure you will be surrounded by a beautiful sea, but let’s take this experience to another wet level. At the Thai Islands you can spend your whole day on the sea, surrounded by crystal clear water. Go on a boat tour, or rent your longtail boat [or a sailboat, if your prefer], and enjoy the day on the water. Sunbathing, swimming, relaxing and enjoying. Life can´t get better than this!! I’m sure you gonna ask yourself: Can we stay here forever??!! I wish we could! Let´s celebrate life! Doesn’t matter what music you like, or if you just want to chill out, at the Thai islands you can have fun from sunset to sunrise. Beach bars will play Bob Marley and put you in a reggae mood. If you wanna get some serious party go to Patong Beach in Phuket, but take care, things can get really wild around there. Feel the sea wind on your hair, dance and play with fire, Koh Phangan has the full moon party, half-moon and black moon party, doesn’t matter in which lunar week we are, there will be a good party going on. But don’t go too crazy, and don’t forget to keep the beach clean. Drink a Leo, the best local beer in Thailand, make new friends and when the sun comes up you will have a huge smile on your face and no regrets. At the Thai Islands you don’t need much to be happy. A bamboo hut on the top of the hill overlooking the sea is all we want after a long and lazy day on the beach. You won’t mind the steps to get there because you know that from your balcony you have the view of paradise. You don’t need fancy closes, high heels or full makeup on. Bikini, flip-flops and a beach towel will be your daily uniform. Your skin will get that golden brown tan, the best souvenir you can take home. If a bamboo hut is not your thing, don’t worry, you can find 5 stars resorts and villas that are waiting for you. For all styles of travellers [and pockets], at the Thai islands you can experience the truly Thai hospitality. Guilty pleasures are permitted here, no one will judge you, even if you want to spend hours soaking in a bathtub under the stars. The view from your room, the view from your swimming pool, the view from the top of the hill and even the view you have from the water when the boat is approaching the shore…. The views in the Thai islands are to die for. Now you understand why we are planning another trip to the Thai Islands? We can´t get enough of it. Nature is majestic, the people are lovely and the food delicious. I’m not even talking about travel budget and the variety of hotels, restaurants, tours and activities. If you never visited the Thai islands, is time to do! Cancel your next holiday and buy a ticket to Thailand, you won’t regret. If you have visited only one of the islands, come back and explore more. Each island is different, if you like the party scene, backpackers bars and yoga retreats go to Koh Phangan. 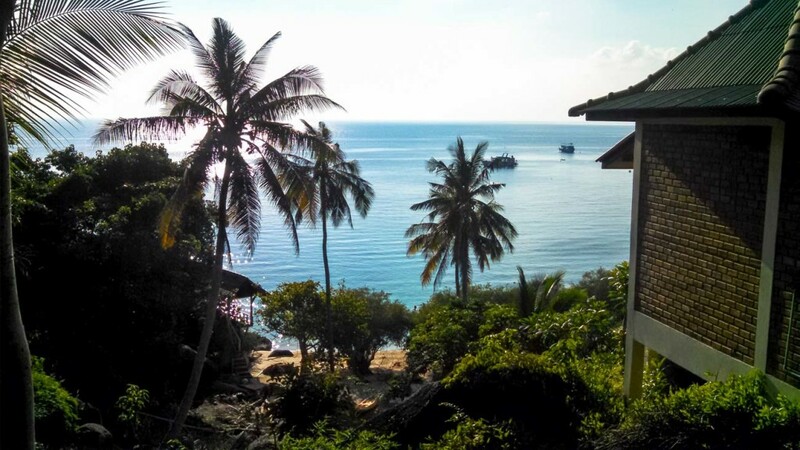 A big fan of diving, so Koh Tao is your place. Looking for luxurious resorts and family activities, Phuket is the biggest Thai island and has so many things to do and see. 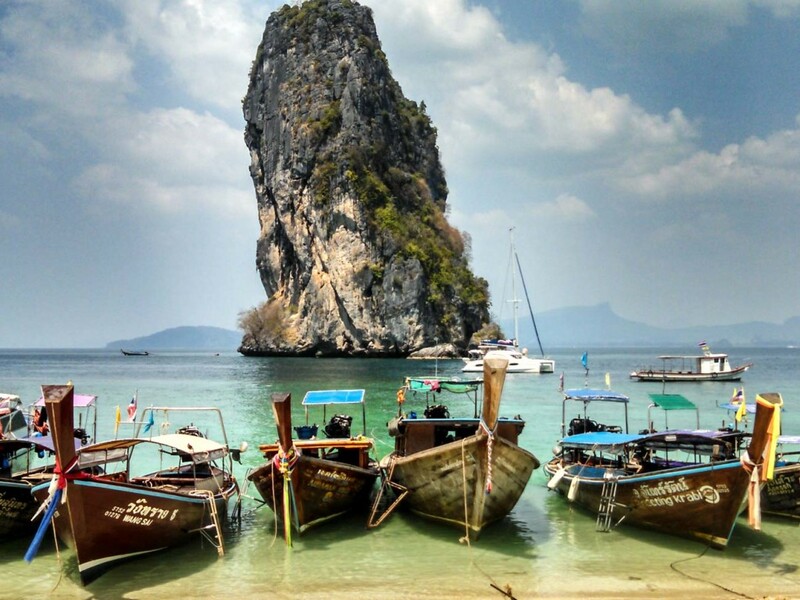 For Hollywood movie location, jump on a boat to Maya Bay or “James Bond” Island. And if you want to walk barefoot on the sand and sleep by the sound of the waves, Koh Lipe and Koh Lanta are still unspoiled and picturesque. I will give you another tip: travel to the Thai islands with an open heart, try the local food, drink the local beer, learn about the local culture, visit the ancient temples and respect the nature. Enjoy the real Thai island feeling, the amazing life surrounded by forests and sea. Love this post?! Pin it for later! Want to know more about travelling in Thailand? We got you covered! 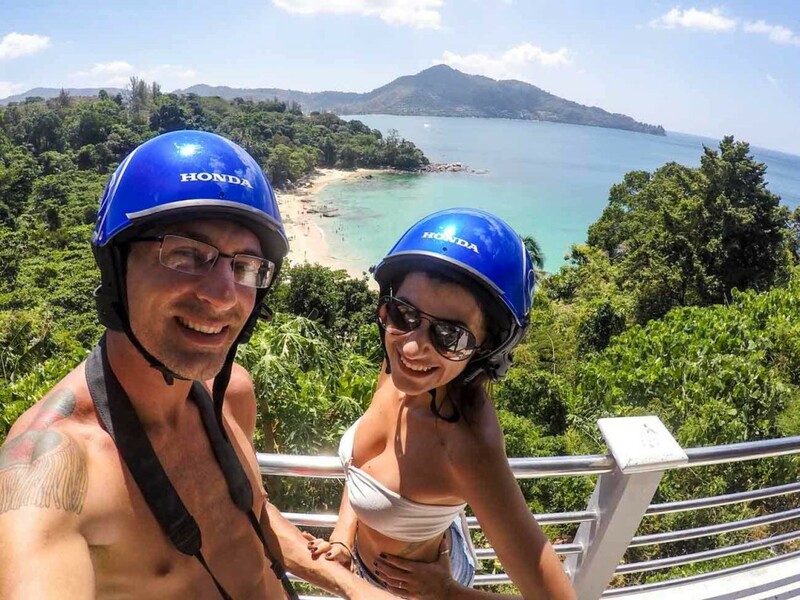 After 8 months travelling in Thailand, we put together a post with our costs, travel tips and all the information you need to Travel in Thailand, on a budget or in a luxurious way. Have we inspired you? Time to plan your trip to the Thai islands! Share with us your travel itinerary, or even better, your favorite place and beaches around the Thai Islands, we might catch up there for a beer! PS: This post was brought to you in partnership with Leo, Thailand´s Best Selling Beer. I have only ben to the Thai Islands once, but I know for sure I will go back there some day. One time is not enough!!! Definitely you need to plan one more trip to the islands!! I learnt so much from reading your post about Thai islands. I can see why you would want to return. I agree on getting travel insurance. There is a show in Australia called The Embassy which is a series about the Australian embassy in Thailand and there are many episodes where an Aussie gets injured or they get alcohol poisoning at a full moon party. Thanks for stopping by! All the best! Agree that Thailand is awesome but I think it is over rated l. It was great 15 years ago but to me it feels like a tourist trap now. There are more interesting ans diverse paers 9f South East Asia to visit. That is such a lovely post. I have been to Thailand 8 times and I so agree with you on spending time in the country. Thailand can never cease to amaze me. Just left Thailand after two months. Gotta go back because aside from a week in Phuket and a week in Krabi/Railay, it was mostly spent in Chiang Mai and I seriously missed out on some island life. Thanks for mentioning insurance! It’s so important if you are going to rent a motorbike. I was also the person who always kept covered up (long pants, lightweight long sleeve shirt, and sandals with straps) on the motorbike just in case of an accident. We spent 3 months in Chiang Mai and now we are heading to the Thai islands for a month. Can t wait! Travel without insurance is a no no. Ahh, this post brought back so many good memories of the four months I spent backpacking around that Thai island paradise in 2009. One of my favorite elements, too, were the crazy rock formations coming out of the water! I didn’t realize before I arrived that those even existed. Good food, friendly people and gorgeous sunsets. What more reasons do you need? Of course you added several! Thei slands of Thailand are certainly stunning – and your reasons for visiting make a lot of sense. Although, I’m a bit past partying from sunset to sunrise. Lovely photos. The Thai islands are stunning indeed. Natalie and Robson, you have totally convinced me that I need to experience the Thai Islands. 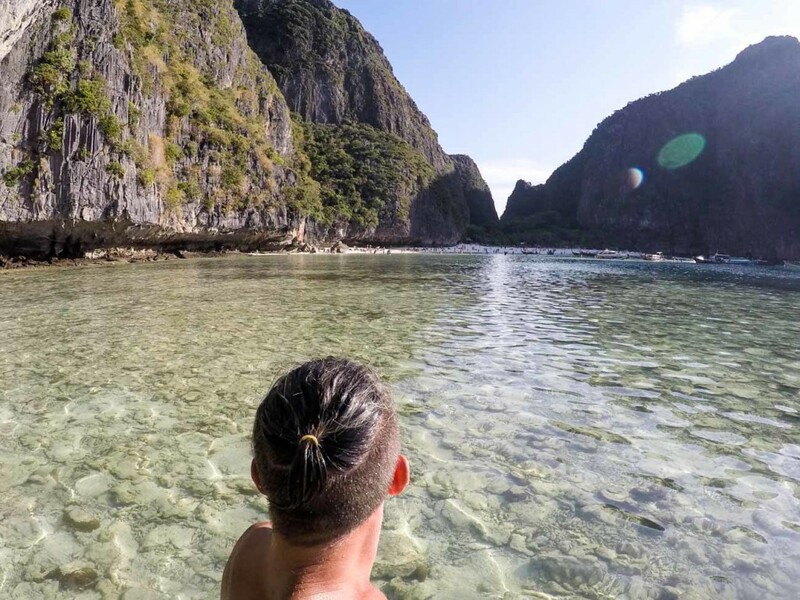 The crystal clear water and friendly fish, the sunsets, the relaxing, casual atmosphere, the bamboo huts, and seafood on the grill make me want to be there now. Exquisite photos and beautiful people, too! I’m sure you gonna love it Howard! Yes! Yes! Yes! You inspired me to go back. I was just in Krabi last month and want to go back again. I loved the turquoise waters and the sunset. But I didn’t like Leo that much hahaha I still go for the good ol’ Heine. Your photos are to die for! I’m really going to try to visit Thailand several times in this lifetime! Can never get enough, the list of things to do and experience in Thailand is never ending. Wonderful photos, it really paints the ideal picture of paradise! I remember lying on a beach looking at the rock formations, just appreciating how naturally majestic it was. You are right Mar, the list of things to do in Thailand is endless. You always can find a stunning place, a fresh food… It’s so diverse! You have convinced me. I really need to include these divine islands in my travel plans. Love the rock formations rising out of the sea. Very similar to the amazing formations along the coast of Muscat/Oman. Come to Thailand, I´m sure you gonna love the islands! Great pictures and reasons to travel to Thailand!Especially the food is just something to look out for. You should also check the Philippines if you are into great beaches, definitely recommendable. BTW, Songkram (water festival) coming up in April now, you should check it out. Enjoy you trip. We already visited Philippines, and LOVE it too! Such a beautiful country! Going to our third trip around the Thai Islands tomorrow, so excited!! This year Songkram we gonna be in Bangkok, we are ready for a big party! Glad you liked the post, let us know when you will around. Our plans is to stay in Southeast Asi till the end of the year, we might catch up here in Thailand! The Thai Islands are incredible! OMG!! We are going to Indonesia next month, looking forward to it, I might fell in love with another stunning country! You inspire me!! Thanks for all the information about your travels, it’s been helpful! Where is your favorite place to stay in the Thai Islands? If you had to pick one? We are going to Australia in September, and now you have me thinking we need to make a stop at the Thai Islands while we are “close” (compared to the US)! You only live once right?! So glad that we inspired you to come to Thailand. The country is beautiful and the islands amazing! 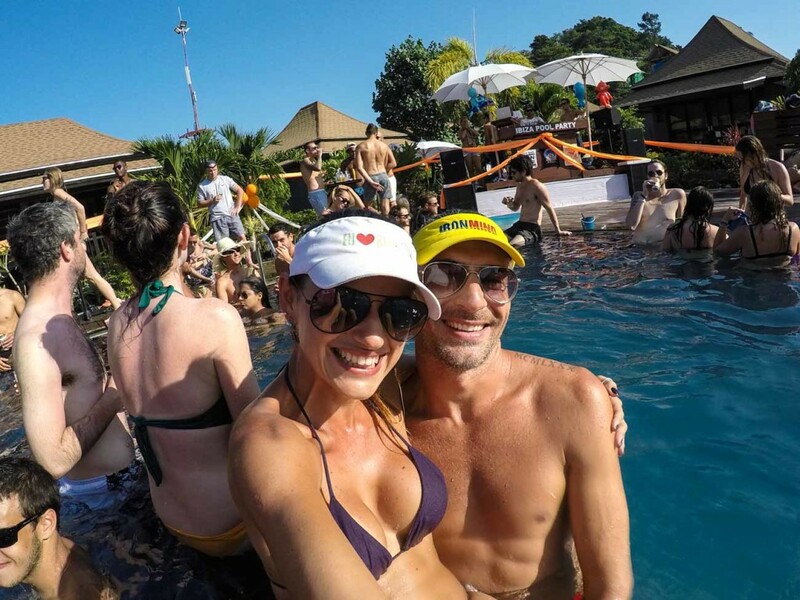 If I were you, I would try to visit at least one or 2 islands… I love Koh Tao, is more relaxed, laidback, good for diving, snorkeling… Phuket is the biggest one, and I like it a lot because there you can have everything, from crazy parties to top resorts, and secluded beaches. But to really enjoy Phuket you need to rent a bike and drive around. Go and Explore! 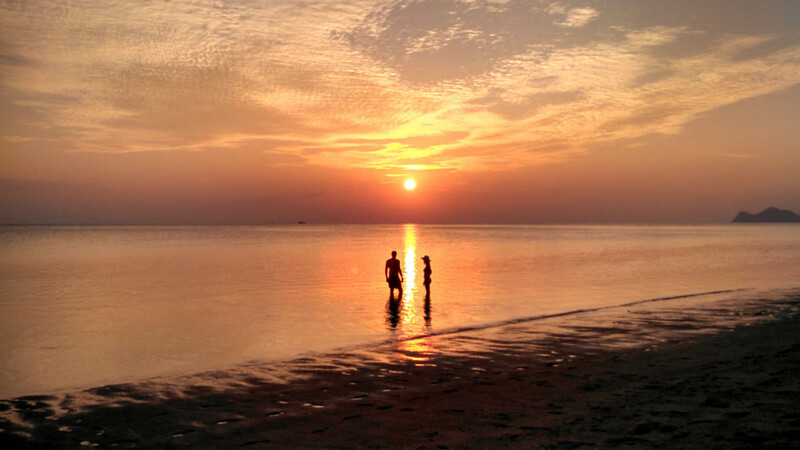 In 3rd place comes Koh Lanta, beautiful, relaxing, but not so easy or fast to arrive there. Phi Phi and Koh Samui are beautiful, but way too touristy. I personally don’t like that much. If you come September or October, be aware that it’s rainy season on the Andaman coast. The best weather will be in Koh Tao, Koh Samui and Koh Phangan. You guys are amazing !! very interesting article. I am traveling South of Thailand in the month of December ’16, basically island hoping. I am even more excited after reading this article. Can you guys give me few quicks tips in regards to dos and donts. As well beaches to visit and stay. Would be a great help if you do so. And yes I am traveling alone, so is there any group which I can join ? If any. So the first tip: enjoy every moment! Secon: you don’t need to buy the ferry tickets in advance, one day before you leave the place is enough. And organize your itinerary in a way you visit first the islands on one side and then on the other side of Thailand, so you will need to cross overland just once. The “joint tickets” are awesome, you buy ferry+boat+van in only one ticket, is the best way to not miss any transportation and most of the time they will drop you in front of your hotel. About hotels, our favorite websites to book room (hotel and hostel) around Thailand are Booking.com and Agoda, we found better and cheaper than hostelworld. Do’s and Don’t: be respectful while visiting temples (long skirts or pants, and cover your shoulder), be careful with the Thai buckets (bad alcohol is an issue in the country) so prefer to drink beers or keep an eye while the bartender is preparing your drink so you know what is going inside. Do a lot of boat trips to small islands, to snorkel, to swim… Before closing any deal, check the price in different agencies and don;t forget to bargain! You can eat street food, no problem, although the best street food is not on the islands but in Bangkok and in Chiang Mai. About the groups, you will find that travellers around Thailand are very open to new friends, I’m sure on your hotel/hostel you gonna meet a lot of great people. I think is that, have you read our other posts about Thailand? You can find them here!There is one really good about the costs of travelling in Thailand. Great post Nat & Rob! We have been looking at our next destination in the SE Asia and were thinking about Thailand. Your article definitely got us excited! 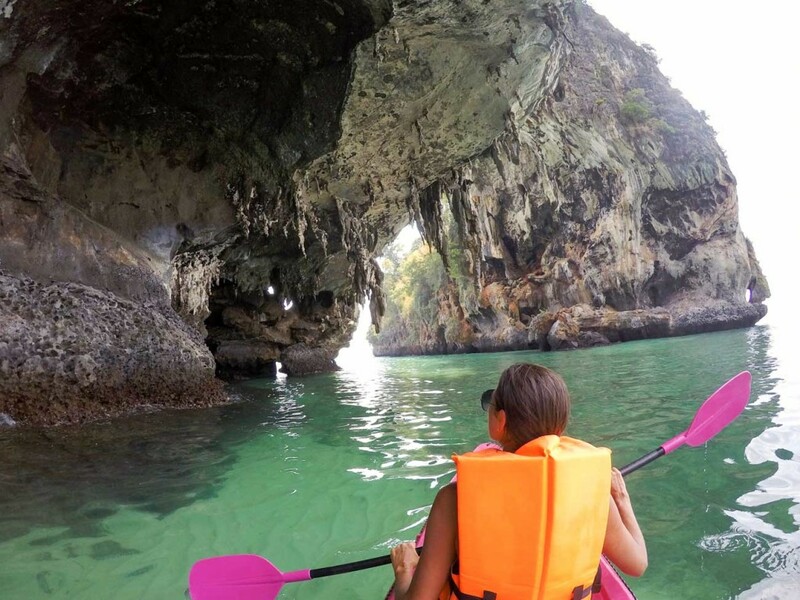 We are so intrigued by Kayaking through those gigantic rock formations. That looks like such a great experience and the pictures are so gorgeous! 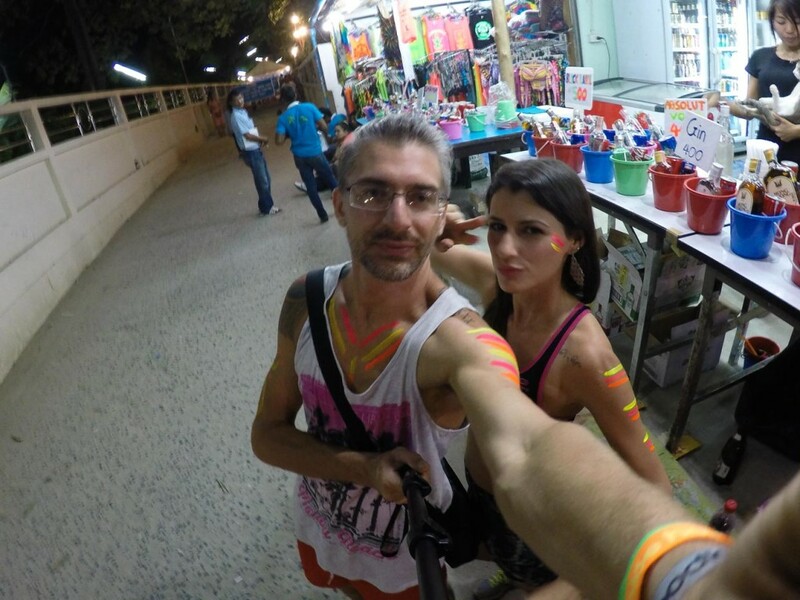 Glad you liked the article and hope you enjoy Thailand!